Alarm clock app with iTunes support. Is there a better alternative to Mornings? Is Mornings really the best app in Personal Info Managers category? Will Mornings work good on macOS 10.13.4? Use an iTunes playlist. Music in the list will play when the alarm goes off! Multiple themes to display the time, each with color choices! 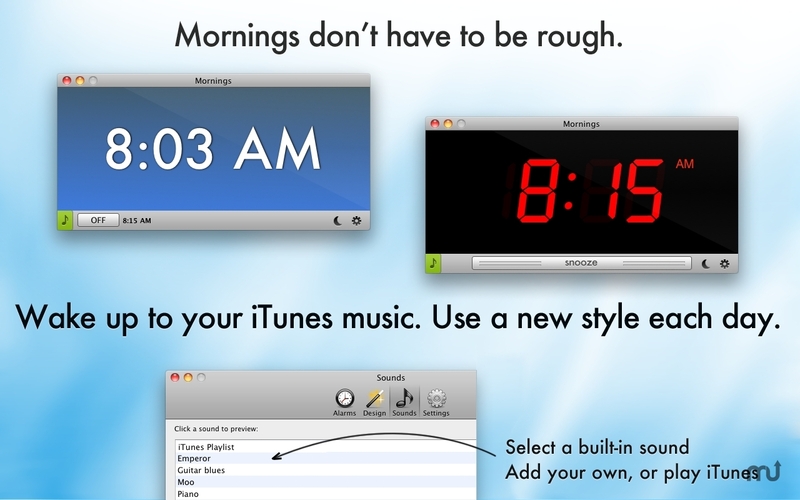 All themes support 24-hour or 12-hour time, based on your Mac clock settings. Set multiple alarms. For example, you can set an alarm to go off at 9 a.m. and another at 11 a.m., if you and your spouse have to wake up at different times. Snooze with a big snooze button or using the Apple remote.